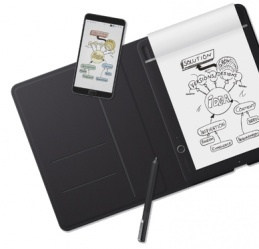 Wacom has now released the next generation smart note pads, with which you can save your notes digitally with the press on a button: Wacom Bamboo Slate (A4 and A5 size) and Wacom Bamboo Folio (A4 size). 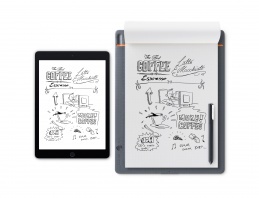 Write and sketch your creative ideas with Bamboo Slate and press the button to transfer and store the information digitally in your tablet or smartphone. It is just as easy to use the Wacom Bamboo Folio, which also has got an enclosing cover with pockets.